5. Am I the only one who thinks Steffy’s face on The Bold and the Beautiful looks painted on? 6. Aren’t Carly and Todd on GH one of the most frightening soap couples ever? They are both evil, conniving and miserable! Are they over? I bet not! 7. Why doesn’t Prospect Park hire a unit publicist for All My Children and One Life to Live? Without any official place to get information, why must we, the soap press, have to rely on leaks and tweets? 8. Isn’t Connie and Tracy on GH becoming BFFs a great soap idea? Love’em! 9. On Days of Our Lives, now that Kristen has destroyed Marlena and John’s family, do you think she really has feelings for that lunky hunk Brady? 10. So who thinks Sammy and EJ will ever be perpetually happy on Days? 11. Doesn’t Jimmy Deshler who play’s Caleb’s son Rafe on GH have potential? I know his “father” was named Rafe, too, but why have there been so many characters on daytime named Rafe? 12. Is there anyone who can’t wait to see Genie Francis return to GH on Monday? Won’t Laura’s reunion with Luke be bittersweet? 13. Doesn’t Fen (Max Erlich) on Y&R look like a young Anthony Perkins in Psycho whenever he gets into a particularly mad mood like those scenes with Dad Michael this week? He’s truly scary! 14. On B&B, what do a coconut and Liam’s head have in common? They are both hard and empty! 15. Whatever have they done to Smash this new season? From this week’s premiere episode, don’t you think Karen is way too old for Jimmy, the young composer she just discovered? So do you have any soap themed questions of your own? If so, send them along and we’ll all discuss! 1 I thought it was pretty tasteless–and I’m a huge True Blood fan. I guess I just don’t expect stuff like that on daytime (which was probably their point). The only good thing I get with Caleb is Easton seems to be having a ton of fun with the role–he’s always played the (admittedly) utterly dull Michael like he was a zombie. 2 I like the triangle, but Burton hasn’t done too much to make me think of him as any different than the man in black from GH. 5 It’s how they show on B&B who is trampy and who is not–this is not a new thing (but you are far from alone). 6 As someone who has hated Todd and how he’s been portrayed for close to a decade I agree… And I think the actors have too much chemistry for the show to give up on the two of them. 7 I think the main reason so many fans still think the PP thing is never going to happen is they don’t have a proper publicist. I’m still trying to find out if their word last year about giving Canadians access to the show is still going to apply–I’ve sent emails… Every bit of info seems to be from actors’ tweeting. If they thing this builds excitement they should realize it just builds doubt. 8 The best female pair up on GH in… years, anyway. 11 It’s rare to see a teen actor who is strong right from the start–the last time I remember seeing that was on AMC with Damon, Finn Wittrock who quite rightly stuck around in New York when the move happened to persue theatre and is now a huge star (getting better reviews than Diane Lane in the recent Chicago revival of Sweet Bird of Youth). 12 The reuinion will be her looking over her shoulder at… someone on Monday, I am sure. By Friday it prob will have her fully featured. 13 I think he’s one of the better new actors they hired–though still seems kinda green, especially by the polished Y&R standards I am used to. 14 The storyline is empty. And, while not hard, it’s been on wash and repeat way too long… But it gets the numbers, I guess. Marlena says: Eric, you’re a big theater fan! Me too! Thanks for the update on Finn Wittrock. And as we know, Jeremy Jordan is from Newsies. To answer your question about the PP publicity Marlena, PP has already released press releases and statements to soaps press outlets like SOD and ABC SID saying which cast members they signed to AMC and OLTL, who’s writing for the shows, and the status of the negotiations between Roger Howarth (Todd), Starr (Kristen Alderson) and Michael Easton (John McBain) between PP/ABC/GH/OLTL. If you register for upates at The Online Network’s website at http://www.theonlinenetwork.com, they will also send you e-mail updates about the latest news from PP’s revival of AMC and OLTL that was already released to the soaps press. Marlena says: Honey Doll, don’t you think Marlena knows that and is already on the Online list? PP already has a publicist in California who sends out releases AFTER the info is leaked. What I’m talking about is a unit publicist, who is someone on the AMC/OLTL set or near it (like in CT) who gives us news we don’t already know — NEW news! Every network soap has a unit publicist. PP should get it together!!! Online sent me info two weeks after it was already leaked on the Internet! I also got the PP e-mail about 2 weeks after I’d read about it online. Doesn’t AMC start taping the week of February 25th? If they don’t have some on-set publicity that week, then I’ll be really concerned! Marlena says: Hi Steve! So great to hear from a fan/friend of 30 years! I admire the performers who play Nick, Avery and Mac. And the Nick/Avery romance needed some conflict. But when Avery and Mac, her long lost love came face-to-face, the reunion came across forced and contrived. They played it as if viewers had witnessed an epic love story transpire between Avery and Mac, like we had endured their pain and heartache right along with them. And alas, Mac died and Avery grieved and eventually found romance with the dashing Nick. To me, that is how the show is writing it and it doesn’t work for me. Down the road, like nine months from now, I would love it if they brought in Avery’s ex husband, Joe Bailey. I know she cheated on him with Mac. I’d like to hear his side of things. I am loving DAYS OF OUR LIVES and I’m curious to see what Nick will do to Will. Nick clearly dislikes Will, calling him gay boy. But I wonder if Nick was raped while incarcerated, which is why he has an issue with gay men. It’s fascinating and ORIGINAL for a soap, The Will story is a prime example of soap writers thinking outside of the box without penning goofy, improbable scenarios. I wonder why no one has mentioned the age disparity between Kristen and Brady. Eileen Davidson looks terrific. She is hot, but she and Brady do not look like contemporaries to my eyeballs. Why isn’t some calling Kristen a cougar? I was wondering about the age difference too. Marlena says: Thanks Szima for doing the math. I guess Smash wants to get into the younger demographic. I hate when shows do that. Now, I have some things to say. I’m not sure how well they’d go over. On “Days of Our Lives,” wouldn’t it have been something had the soap dared, a year or two ago, to have Will and EJ experience a forbidden fling? Okay, it’s wild and wicked of me. But who couldn’t take a moment with this and go ahead and envision the reactions from Sami and Lucas? On “The Bold and the Beautiful”—which has been milking for a good two or three years the love triangle of Steffy and Hope fighting over Liam—wouldn’t it be wonderful if these two ladies came to their senses and reached a bipartisan agreement that, in all reality, Liam is so unworthy of them. That, for these two ladies, he represents a phase of “infatuation” that is, well, over with! On “The Young and the Restless,” the casting of Steve Burton to work with Jessica Collins was a marvelous move. Collins’s Avery was one of a few new characters whose arrived a couple years ago actually worked out with blending into the canvas of Genoa City. (So many others fell flat or absolutely bombed.) It further adds another few pages to the entire history book of the near-20-year Phyllis Summers character played by Michelle Stafford. On “General Hospital,” can we have a returning Laura Spencer—played by the true original Genie Francis—be a lasting one? I’m so accustomed to occasional visits, over the past decade, that I’m not terribly motivated to make a point of tuning in when it would only be brief. This is one of the greatest characters—and actresses—any soap has ever seen. I want to see Genie and Tony [Geary, as Luke] together again. Marlena says: Thanks, dear DSO. We switched over to Downton from the Grammys too. Are you talking about Thomas and O’Brien? I agree with you on your Days opinion, and what you wrote about B&B was going to be next week’s column! LOL! Marlena says: I love Edith — I indentify with her intensely. (She’s a columnist! A late bloomer romantically!) And Lord Grantham was way too accepting of Thomas’ homosexuality for an aristocrat of the times. By the way if you’d like to read a long piece I wrote on Downton published today in a newspaper, see http://www.poconorecord.com/apps/pbcs.dll/article?AID=/20130211/NEWS/302110307&cid=sitesearch. Enjoy! I’ve debated this (with myself and with others, lol) since the DOwnton episode aired back in October in the UK, but, while I think Lord Grantham was maybe a bit too laissez faire about the issue of homosexuality–I can buy it. Yes, he’s hard to accept more accepted progressive ideas, like women’s rights, but having studied a lot about VIctorian and Edwardian issues around (male) homosexuality, it speaks of his upper class status that his attitude would be one of, as long as it isn’t made too obvious he just accepts. Particularly some 25 years after the Oscar Wilde trials, the fact that he came from an upper class, boys public school, etc. However, the fact that it did become an issue and could have caused a scandal on the house is where I think he acted more leniant than he might have. But his basic attitude (“Do you know how many boys tried to kiss me at Eton” or whatever he said–it’s been a while) IMHO rings true. Marlena says: Thanks for your compliment on my article. I hear the next Downton episode has much to discuss. I can’t wait…although I know it will be tragic…. 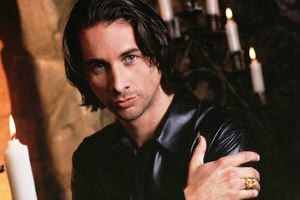 I had stopped watching Port Charles by the time they started the telenotella-style 3 month story arcs, so I never saw Michael Easton as Caleb. While I never cared for Easton as McBain on OLTL, I have come to enjoy him as McBain on GH. That said, I’m loving his Caleb. Seems to be having fun playing the character who is deliciously evil. A nice change of pace from McBain. I thought tasting the blood was right in character. Didn’t gross me out in the least. And yes, Fen on Y&R does come across as a young Anthony Perkins. Has a scary intensity to him that’s rare for such a young actor. That’s why I’ve come to like him and the storyline. Wouldn’t want to be trapped in an alley with either Caleb or Fen. I agree Michael Easton seems to be more alive as Caleb.Oxymoron.? His smile just melts you and makes you hope PP doesn’t keep the actor. I don’t care for the vampires ,but I am happy to see all the returnees. I don’t watch Y&R or BB I am still angry at that network for cancelling the two shows I did watch. ATWTS and GL. gripe about,he did worse to Molly than her helping Rafe. I also watch Downton Abbey,and no matter whats on the other channel,I do not switch. Ilike all the characters,soaps need troublemakers so Mrs O’Brian and Thomas need to stay. Edith needs a life,if she hadn’t been such a sneaky one trying to ruin her sisters life she may have had one.Anyone think the stood up at the altar was a way to have viewers feel sorry for her,and want to root for her. So she will get a life! than she even did on GH. She looks great and she deserves to be back. Lately the show actually looks like GH.For the most part I like the show I just wish Lucy would tone it down a little. Like most of us, you are probably stuck in the mid- late- 1990’s when he did his best work (and you wrote about him in Soap Opera Weekly). Sadly, he has been phoning it in since he won that Emmy in 1999 and all of us “General Hospital” fans have been suffering with his robotic acting ever since. This isn’t to mention how he has let himself go (cough, steroids, cough, protein shakes, cough!). Marlena says: Just once I’d love to hear something positive from you, Kevin! Can I just say this ,not minding my own business. But Steve Burton always phoned it in. I never saw him actually be in the moment, Of course I did have to FF most of him. I for one am thrilled he went to Y&R. That show has eric braden who makes me turn the channel, on it so now with SB there ,I will never be tempted to watch the show. I guess a lot of us had enough of Sonny and Jason winning no matter how far they pushed it. Now the show is better, not perfect but, better. Watchable I should say. I shut GH off for a long time and now I watch .In real time commercials and all. Sorry for sticking my nose in. Love your reviews for the most part.